Aléxandros’ name means “Defender of the people!” He is a wealthy Greek landowner living in the year 375BC. His main occupation is overseeing the building of city walls and tower defences in his home city of Karthea on the island of Keos in the Aegean Sea. Ancient Karthea is the most important of the four city-states of the island of Keos. Aléxandros lives in Karthea with his wife Deborah. His slaves farm his lands, which are outside of the city walls. Karthea is currently allied with Athens against Spartan imperialism and Persian pirates! Persian pirates have managed to capture some men of the city by grabbing them by their beards, so Aléxandros has recently decided to shave off his beard! Aléxandros loves the theatre and enjoys recounting performances of the Story of the Monitaur, Daedalus and Icarus. Matthaios, Aléxandros’ younger brother, is a hoplite or soldier in the army of Karthea. The different city states are almost constantly at war with each other. Death in war on behalf of one’s city is seen as the most glorious death. 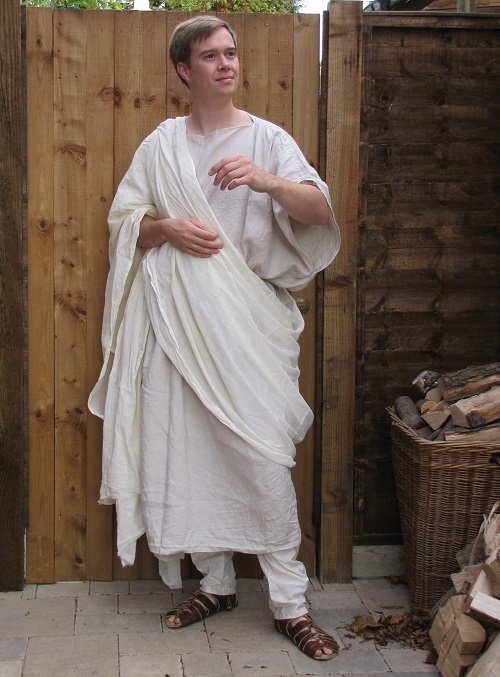 Aléxandros can teach his audience the pyrrhic dance Greek soldiers use to make ready for war! Aléxandros has a strong faith and has observed that the appearance of Sirius (the brightest star in the sky) heralds the hot and dry summer, and fears that it causes plants to wilt, men to weaken, and women to become sick. Inhabitant of the island of Keos, such as himself, offer sacrifices to Sirius and Zeus to bring cooling breezes. There is no set script for the presentation, it depends on what artefacts or subjects interest the audience. However, the material can be steered in the direction(s) desired by class teacher. Aléxandros can talk about aspects of ancient Greek life to do with war, medicine, health, food, leisure time, clothing, beliefs, family roles, houses, occupations, and entertainments.